TOP SECRET, In plain view...: Pretty fascinating article on the business of aerial satellite imaging and the censorship -- or lack thereof -- that is practiced / (un)enforced when it comes to capturing photographs of highly sensitive security locations around the world. Contingencies for nuclear terrorist attack: The U.S. government is "working up plan to prevent chaos in wake of bombing of major city," based in part on the Preventive Defense Project (PDP). Iran's Invulnerable Bunkers? : "A few weeks back, the Air Force detonated out its most powerful bunker-buster yet. But a new Iranian super-strong concrete might make it almost useless before it reaches service." Billion-Dollar Bunker: "During the Cold War, plans to provide nuclear shelters for the public were rapidly shelved after the atomic bomb gave way to the multi-megaton hydrogen bomb. But, as NJ McCamey’s Cold War Secret Nuclear Bunkers recounts, there were deep and hardened shelters to protect essential military and government assets and help with national reconstruction afterwards. One of 'em held billions of dollars in cash." Get Your Own Embassy: "Looking for a distinctive vacation home? There are 29 U.S. embassies for sale worldwide, several with prices under $500,000." US puts trust in Alaska missile shield: "Hidden deep in the Alaskan wilderness lies America's latest weapon in its war on terror. The heavily defended Fort Greely is the centre of America's missile defence shield." Pentagon vs. Nature: "The CIA and the Pentagon would for the first time be required to assess the national security implications of climate change under proposed legislation intended to elevate global warming to a national defense issue." The Unspoilt Beauties of Nature: Bouphonia leads us on a little tour of the news concerning chemical weapons.... and also responds to Berardi's City of Panic that I blogged about a few days ago. Riffing off me, Phila writes "If we want to, we can find “implicit panic” in everything from seatbelts to non-slip shower mats. I think that what’s important about Bryan’s examples of “architectures of control” is who they represent as a threat (i.e., the poor, minorities, foreigners, and so forth), and to what extent we experience that representation as gratifying, or convenient, or what have you. From this standpoint, one could argue that Berardi is wrong because he misses the point that “cities of panic,” far from being too complex, are too simple, inasmuch as they tell us what we want to hear. (Unlike, say, the somewhat more ethically demanding City of Refuge.)" autoautism on military urbanism and new plans for China's Tianamen Square: "Perhaps the greening of Tianamen doesn't represent the elimination of military urbanism, but rather it's utilization, atomization, and slow diffusion. Perhaps the future landscape of our cities will be as much about control and defense as it is about citizenship. We are building an entirely new form of walled city, one where the moats and battlements are part of the fabric, not surrounding it." Much more at Archinect. An Island for Destroyed Cities: Given the endless destruction of buldings as a result of war, either deliberately or otherwise, Geoff writes, "For instance, all the gravel, dirt, and foundation stones from ruined buildings and cities around the world could be dropped into shallow waters off the western coast of Greece – forming the base of an artificial island, as large as Manhattan, on which to build your memorial to cities and spaces killed by war..."
HOLLOW STATES: "One of the most confusing aspect of modern insurgency for the "experts" * is that nearly every guerrilla group worth observing is advancing on the objective of state failure rather than state replacement. ** As in, why would Hezbollah want to rule Lebanon? Who would want that headache? The reason that state failure, or a hollow state, is preferable to state replacement derives from the same counter-intuitive rationale that Lawrence (of Arabia) based his campaign against the Turks upon: partial failure offers many more benefits that complete failure. In this modern case, a hollow state is preferable because:...." (also: Inside the Brave New War, Part 1, Inside the Brave New War, Part 2). Bringing Them Home, To Homelessness: "Tens of thousands of veterans are suffering from mental illness and homelessness, and as more soldiers return from Iraq those numbers are expected to grow." A monstrous war crime: "It estimated that 650,000 Iraqi civilians had died since the American and British led invasion in March 2003." Beyond the Green Zone's 'Gated Community,' Bush's Surge Is Failing: "Bush's "surge" has put army and police checkpoints everywhere in Baghdad but Iraqis are terrified approaching them because they do not know if the men in uniform they see are in fact death squads." Iraq’s cloudy horizon: "The insurgents in Iraq are forcing the United States military into a tactical corner and thus casting shadows over its surge strategy." Signs that the PMC industry may survive a US withdrawal from Iraq: The Iraqi parliament has hired a PMC to protect itself. Outsourcing the War: "Jeremy Scahill, bestselling author and investigative reporter for The Nation, testified May 10 before the House Appropriations Subcommittee on Defense on the impact of private military contractors on the conduct of the Iraq War. This is the full text of his remarks." (See this earlier post on Blackwater). No idea how many contractors in Iraq: "Four years and $500 billion into the Iraq war, the U.S. military still has no idea how many U.S. contractors are at work there." Defense Skirts State in Reviving Iraqi Industry: "Brinkley and his colleagues at the Pentagon believe that rehabilitating shuttered, state-run enterprises could reduce violence by employing tens of thousands of Iraqis. Officials at State counter that the initiative is antithetical to free-market reforms the United States should promote in Iraq." War Profiteering and the Concentration of Income and Wealth in America: "How Escalation of War and Military Spending Are Used as Disguised or Roundabout Ways to Reverse the New Deal and Redistribute National Resources in Favor of the Wealthy." Deconstructing reconstruction: (Beirut) "City Debates holds multidisiplinary seminars on effort to rebuild in wake of 2006 war." War as Theater: "Modern conflict is now deterritorilized, focused on ideology, culture, society, or economics. Secondary is the physical space. Modern battlefields discount the need for enemy’s order of battle. Increasingly important is knowledge on media availability (foreign and domestic), audience receptivity (will they listen), public opinion (what will they think if they do listen), and the roles and functions of information systems to understand what could be termed “information channels”." helmut at phronesisaical, who is readying a book on the subject of torture, says this about Padilla. He is "a bad man who is also, now, a product of torture, an objectification of torture. In other words, as I've argued about torture, he is whatever the torturers wish him to be. This is of the very essence of torturing for "information." Now, we will see this human product displayed in a courtroom where, even more so than in typical court cases, the entire case will be played out as a struggle between competing notions of reality where the tortured object becomes simply a fulcrum, an instrument, on which political reality turns." Shot Spotter: "Last year there were 148 homicides in Oakland. Today, when someone fires a gun on a city street, a network of hidden microphones kicks in — triangulating the exact location. And alerting police. Can a tech startup help put a dent in violent crime?" "Illusions of Security" (podcast): "Canadian human rights lawyer and activist, Maureen Webb, argues that the new global security system is threatening both American and global security, and undermining democracy worldwide. She talks with openDemocracy's editor-in-chief Isabel Hilton." 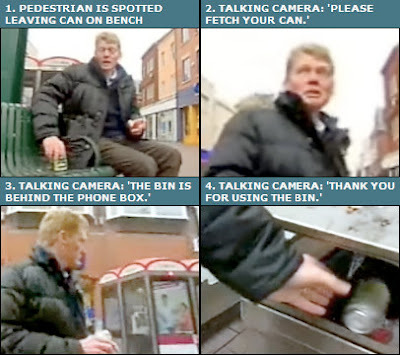 Talking video cameras in England scold citizens: Just check out the video. Lip Reading Surveillance Cameras to Stop Terror: "Shouting, face scanning, eavesdropping, X-Ray firing and now lip reading CCTV, do you still feel free?" Seeing through walls: "Have you considered that someone could be reading what's on your monitor from a few rooms away? It's unlikely, but possible, as work by Cambridge University computer security researcher Markus Kuhn shows." Clive points me to this piece Bots on The Ground: "In the Field of Battle (Or Even Above It), Robots Are a Soldier's Best Friend", and the emotional attachments soldiers face sending their little buddies to go get blown to smithereens.